I have a cut off for exercise. If I haven't done it by 7:30 pm then it just isn't going to happen that day. It just gets too complicated with eating dinner and getting home to shower and all that jazz. Plus I was convinced that if I exercised too close to bedtime (and I am not talking about yoga here) I would be awake for hours because my body would be revved up. Honestly, that thought process was thrown out the window last week when I went to a blogger spin meet up at Revolve DC. Since it started at 7:45, I was breaking all sorts of rules. I made the effort to eat dinner before I left (don't judge the two meals at my desk that day), told my hubby he was on his own and set off. The class was great and when I got home at 9, I was beyond exhausted. I showered and then immediately went to bed. No tossing and turning, just straight up knocked out. Then this week the National Sleep Foundation released a survey showing that there was no difference in sleep quality between those who exercised early in the day vs. those who exercise at night. 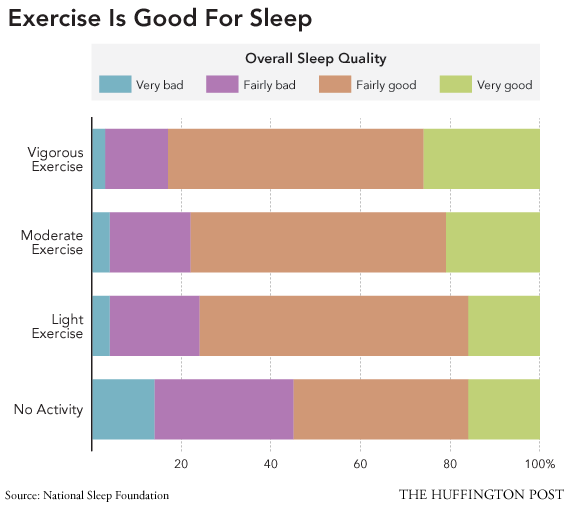 In an interview with the Huffington Post (see graph below), Michael A. Grandner, Ph.D. an instructor of psychiatry and a member of the Behavioral Sleep Medicine program at the University of Pennsylvania, said "If you can get your activity [at least] an hour or two before bed, that's probably ideal. But chances are you're probably not going to get the intensity or duration you'd need for it to impair your sleep." I am thinking as long as I find a way to eat dinner before, I might be picking up a few 8pm classes I've been avoiding.